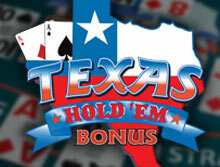 Evolution Gaming in partnership with Games Marketing has released Live Texas Hold 'em Bonus Poker. The game is an addition to the developer's vast collection of live casino games. Optimized for mobile phones, tablets, and desktop computers, this poker variation offers all the thrill of the fast-paced game. This in-house casino game is played against a dealer. There are two separate special bonuses: the Bet bonus and the First Five Progressive Jackpot. The live dealers are welcoming and elegant, and you can initiate a conversation with them using the Live Chat feature. One good thing about Texas Hold 'em Bonus Poker is that it is scalable. Thus, the unlimited number of punters can join via the Live game lobby of using the Direct Game Launch links in websites or emails. Evolution Gaming is one of the pioneers in live dealer casino game creation. The developer has been bravely paving the road to innovation and advancements in technology. They have to build a healthy business partnership with reputable casino operators across the igaming market including the UK. The company is licensed by the UK Gambling Commission, which is why it boasts of one of the biggest markets. With their live studios set up in Latvia, Malta, and Romania, you will be able to enjoy HD games from the comfort of your home. bCasino is a relatively new UK online casino site which is powered by Evolution Gaming. The casino site is owned and operated by GS Technology limited company which is licensed and regulated by the UK Gambling Commission. bCasino is a one-stop shop for all your gambling needs. The game library consists of a plethora of games including blackjack, roulette, baccarat, and video poker. They also have an excellent rewarding program where all new players receive a 100 free spins plus $1200 bonus on the first deposit. The customer support service at bCasino is unparalleled to any other. They have employed skilled, friendly, and dedicated agents to answer all your questions 24/7. Texas Hold 'em Bonus Poker by Evolution Gaming is based on the classic multi-player Texas Hold 'em poker. The only difference between the two is that the new variant is played against the house. Also, there is no bet after the River card is issued. As the name suggests, this hybrid of Live Casino Hold ém and Live Ultimate Texas Hold 'em offers a double bonus which comes as two optional side bets, Bonus Bet and First Five Progressive Jackpot. Both gifts offer separate additional opportunities to win, irrespective of the dealer's achieved hand. The Bonus bet rewards players up to 1000:1 whereas the First Five Progressive Jackpot offers an increasing progressive jackpot for a Royal Flush. Being the first ever created Live Texas Hold 'em Bonus Poker, the developer is ready to part with a substantial progressive jackpot which starts at $50000. Punters from around the world will be excited about playing this new variant of online Texas Hold em poker. You can play this game and other variations like Ultimate Texas Hold em, and Three Card Poker in HD at bCasino. Texas Hold em Bonus Poker features a single deck of 52 cards. The primary objective of the game is to end the game with the best hand. The player is dealt with two cards facing upwards which are known as Pocket Cards. This comes after placing abet called ante bet. All the dealer's Pocket cards are dealt facing downwards. The player can choose to fold or raise depending on their pocket cards. The three flop cards are revealed after the player has made a decision. By Calling, the player means a wager equal to the Ante bet is placed. The last card to be dealt is the River Card and is dealt. It should be noted that the main game has a theoretical return to player of 98.41%. The side bets are resolved separately from the main game's wagers. The option for Live Chat enables players to communicate with dealers and other players. It is compatible with major mobile operating systems like Android, iOS, and tablets. Are you excited to be among the first people to play Evolution Gaming's Texas Hold 'em Bonus Poker at bCasino? We are proud to be in partnership with this leading software developer among many others. Our site offers all players with a chance to join the VIP Club and enjoy several exclusive offers. Moreover, you will be able to withdraw and deposit your funds using some of the widely accepted payment options. Play Texas Hold em Poker Bonus at bCasino today and stand a chance for bigger prizes including a progressive jackpot.